Frontier is a love-it or hate-it airline. 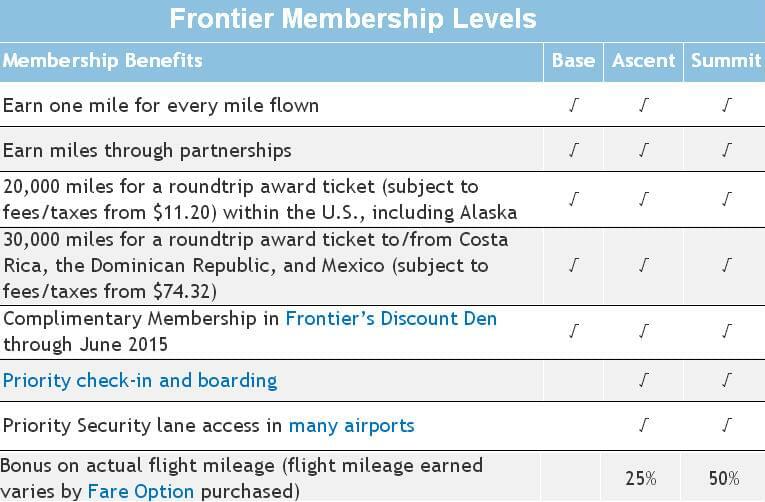 Although it’s not quite in the same league as its domestic low-cost competitor Spirit, which recently solicited hate mail from travelers in exchange for 8,000 miles, Frontier is unapologetic about its high fees. Those fees allow them to offer low fares for people who want them, and a higher price for people who are happy to pay to be comfortable. According to the Denver Post, Frontiers fares have seen an overall 12 percent reduction on prices since implementing this strategy. Its cash fares are now an average of 18 percent lower than Southwest. 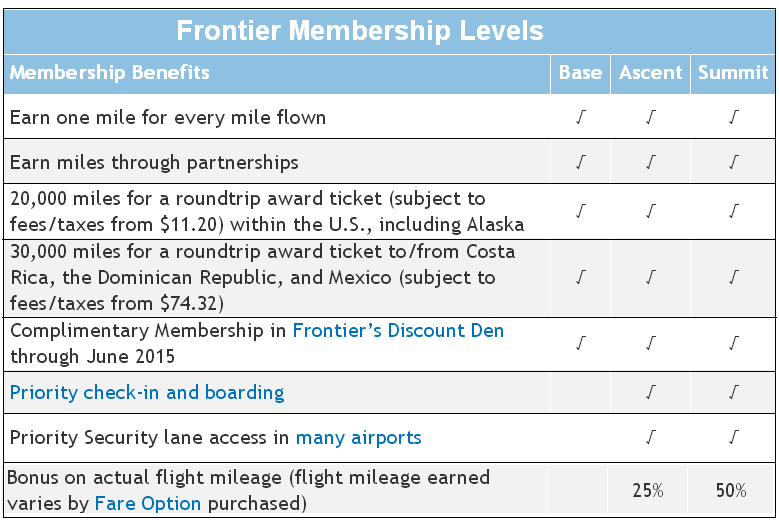 The one place where Frontier is friendly to its flyers is in its generous reward program. It pegs domestic awards at a 20 percent discount compared to legacy domestic carriers. When you obtain status with Frontier, not only do their annoying fees go away, but you also have complimentary access to extra-legroom seats. As a low-cost carrier that tries to segment its pricing structure not just for profit but also to make sure that each passenger gets the right experience for their needs and wallet, Frontier can be a great choice. Frontier flies to 75 destinations, but they don’t service all major U.S. cities. If you do live near its hub in Denver or one of its other main airports, including D.C., EarlyReturns miles could be worth stockpiling. How Can You Use Frontier EarlyReturns Miles? With the option to transfer miles from Diners Club or American Express Membership Rewards, you don’t have to earn all of you award miles by flying. But since their fares are so low, Frontier is great mileage run fodder. Since Frontier does not share mile earning or redemption with any partner airlines, its award chart is very straight-forward. Domestic awards on Frontier begin at 20,000 miles round-trip a 20% savings on legacy domestic carriers. Award flights to Mexico, Central America and the Caribbean clock in at 30,000 miles round-trip, which is a great deal if you minimize fees. 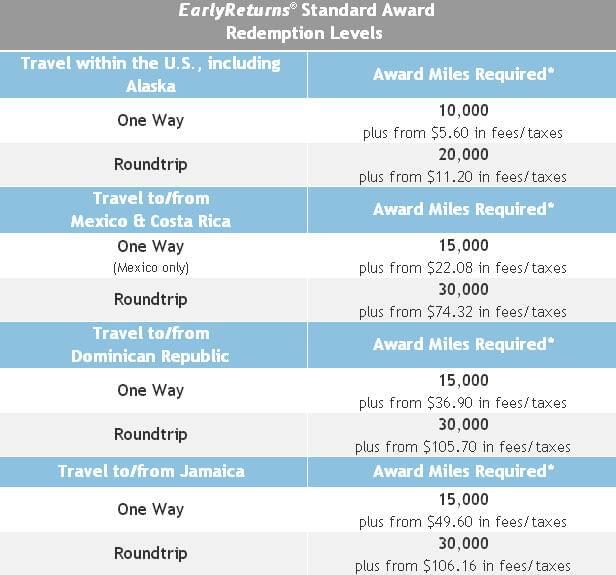 The key thing to remember when redeeming awards is that Frontier levies award redemption fees, depending on how far in advance you’re booking. There is a two-month fee-free window, but then award booking fees kick in. That’s much earlier than most airlines, which reserve fees for booking 21 days or fewer before departure. While some carriers group the Caribbean in with the U.S., Frontier is the only domestic carrier that lets you get as far as Costa Rica for barely more than a domestic round-trip on most carriers. For this international route, the taxes and fees are a bit higher than your average award, around $100 round-trip. At only 30,000 miles, though, its a big savings on both legacy and many international carriers. Frontier prides itself on its low fare prices, not its low fees. You can easily end up spending miles on flights where you would get a better value paying in cash, especially if you are booking close in enough that you incur an award booking fee. One week before departure, cash fares on Frontier between Washington, D.C. and Las Vegas were as low as $102 one-way. If you bought the ticket as an award, you would pay a $50 last-minute booking fee, taxes, other fees and 10,000 miles. If you value miles conservatively at one cent per mile, you’re losing money. The loss is even worse if you attribute a higher value for Frontier miles. Until that change, there are two tiers to the EarlyReturns elite program. The higher level includes the benefits of the lower level unless otherwise noted. The card carries a $69 annual fee, but includes 40,000 miles after a $1,000 spend in the first three months of holding the card. A no-fee option is also available, but it only carries a 10,000-mile sign-on bonus. The card accrues one mile per dollar on FlyFrontier.com purchases and one mile per two dollars on everything else.